Inspired by a trip to Italy, French sculptor François-Auguste-René Rodin created his first major sculpture in 1875. Throughout the course of his career, he often pursued commissions for unconventional memorials. Many of his most notable sculptures, which were deliberate fragments or intentionally left unfinished, were criticized during his lifetime as they clashed with the traditions of the French Academy. In contrast to the Academy’s interest in more formulaic and decorative figural sculpture, Rodin rejected traditional mythological and allegorical themes. He believed the goal of his sculpture was to promote inner feelings through muscular movement. 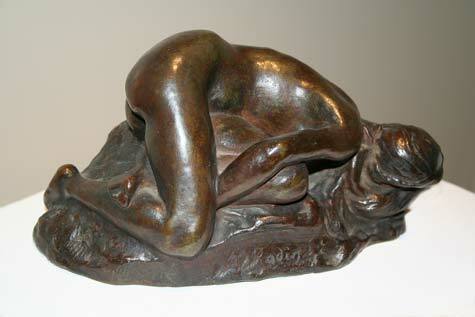 Rodin studied the works of Michelangelo (1475 – 1564) and Puget (1620 – 1694) to help develop appreciation for the portrayal of emotion in the human form. The surfaces of his sculptures catch the subtle play of living motion and light and show careful attention to details of anatomy. In Young Girl Reclining, the contrast of textures between her polished skin and the roughhewn ground emphasizes the sensuous softness of her languid body.